The Foundation for Economic Freedom (FEF) tapped the Friedrich Naumann Foundation (FNF) 's support for its monthly discourse on economic issues on 26 June 2007 in Makati City. 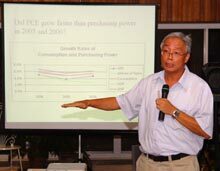 University of the Philippines School of Economics Professor Felipe Medalla took a closer look at the country’s Gross Domestic Product (GDP) growth figures. He noted a persistent discrepancy between GDP figures on the one hand and figures for consumption, tax collection, investment, government spending and exports. While the economy is clearly growing, it seems to do so at a significantly lower rate than the official figures. This is also borne out by both anecdotal evidence and the remarkable macroeconomic stability of the economy; historically, a growth rate as high as the official one would have caused inflation and interest rates to rise. His conclusion was that the official statistics have, over the last years, become too optimistic and the statistical methodology might need to be adapted. FEF is a member of the Economic Freedom Network Asia (EFN). EFN is an organization of think tanks and research institutes from more than 20 countries in Asia. It serves as a platform for political debate, public education and academic exchange in order to further the public policy debate on the merits of the free market and limited government. The Foundation is a partner of EFN and regularly sponsors its annual conferences.